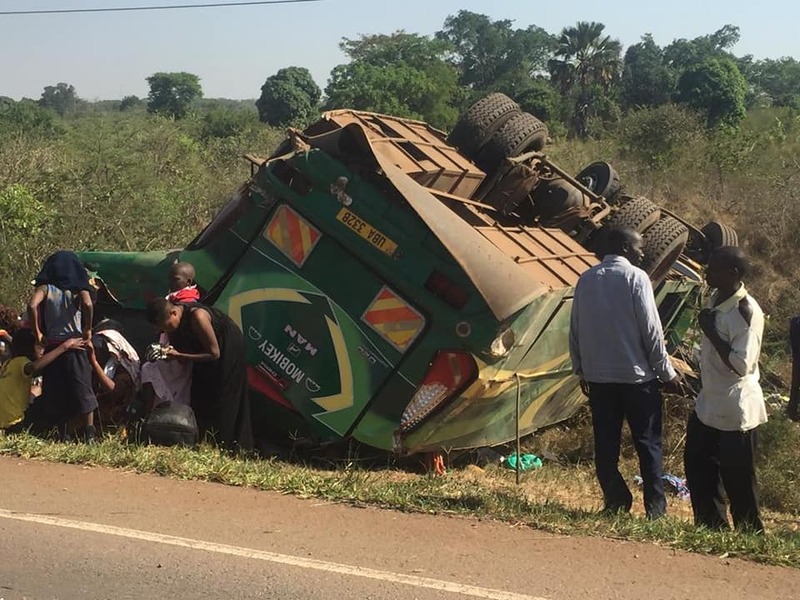 NAKASONGOLA – Four people are confirmed to have died on spot this morning after the bus they were travelling in overturned at Namayonjo, Nakasongola. The Link bus registration number UBA 332B that was heading to Masindi from Kampala had a tyre burst swerving off the road and overturning several times with over 5o passengers on board. Police reports reaching this website confirmed that over 30 people were severely injured and are currently receiving treatment at Nakasongola Military hospital. A number of nasty accidents have occurred along the Kampala-Gulu highway in recent months. Among them was an accident that claimed the lives of 23 people and injured 14 others in May, 2018. The accident involved a Gaagaa Bus registration number UAK 562L and a cargo lorry registration number UAT 088 J / UAT 321 M and a tractor registration number UAU 872 M.
Another accident killed five people and three others were critically injured at Namayonjo village, Nakasongola along the Kampala- Gulu highway. This involved two cars, a Toyota Hiace registration number UBD 061D belonging to Pepsi Cola ‘Twangula promotion’, a Pick-Up UAX 182F loaded with chicken and a motorcycle. Police blame the most accidents on over speeding.